From Mediaite: MSNBC might want to take a look at a map. Mediaite explains, “Apparently the graphics producers working during Martin Bashir‘s MSNBC show failed geography in school? 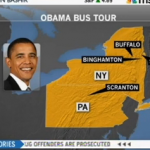 During a report on President Obama‘s upcoming Upstate New York bus tour, MSNBC unveiled this doozy of a map, placing four well-known NY/PA cities in the entirely wrong geographical spots. So… did someone just throw darts at a map of New York and Pennsylvania and randomly decide to place those four cities where ever they fell? Syracuse is probably about 150 miles west of that spot; Binghamton roughly 150 miles southwest; Buffalo 300 miles west; and Scranton is most certainly at least 100 miles east of that mountainous region in central Pennsylvania. But, hey, ‘A’ for effort. At least Scranton is in Pennsylvania and the other three are within the borders of New York. So there’s that.” See the map and watch the segment here. From Gossip Cop: Is Kim Kardashian raising baby North alone? Gossip Cop reports on the re-appearing rumor: “Kim Kardashian is raising her baby North West ‘alone,’ reports Star. The mag claims the reality star is feeling overwhelmed by her new life and struggling to raise Nori on her own, alleging that Kanye West’s recent business trip to Greece ’caused friction with his stressed-out, shut-in girlfriend.’ According to a so-called ‘source’ for the mag, ‘Before Kanye left for Greece, she had a meltdown where she begged him not to leave. But he told her she needs to get herself together and stop being so clingy, then he walked out to the door to catch his flight.’ The purported ‘insider’ says Kardashian ‘resents Kanye for ditching her,’ adding that when the rapper is home in L.A., ‘he holds Nori, but that’s about it — he doesn’t help with feedings or bathings or diaper changes.’ That’s funny, because Star just reported that Kardashian was jealous of all the attention her daughter was receiving from West.” Find out what’s really true here. From Geekosystem: There’s more Ron Burgundy heading our way. 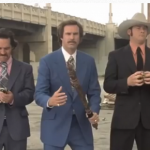 Geekosystem explains, “While we are all thrilled by the return of the classiest man this side of the seventies, waiting until Christmas for the next chapter in Ron Burgundy’s life does seem awfully unfair. Luckily, selfless man that he is, Burgundy is set to release a tell-all memoir November 19th, though no word yet on if it comes with an EP of his jazz flute recordings. The full title is: Let Me Off at the Top! My Classy Life and Other Musings, so we can pretty much assume it’ll be, well, classy. It could also be full of musings about things that aren’t classy, like fighting in gang wars while not wearing a suit or that ship named Diversity in the, uh, Civil War era.” Read more about the book here. From Styleite: The next installment of The Hunger Games hits theatres soon, and is already making an impression on the fashion world. Writes Styleite, “[W]e’re fired up about CoverGirl’s new The Hunger Games: Catching Fire Collection, and now that we’ve had a first look we’ve made it our goal to dive into the series before the line hits stores on October 1. These preview images were created by makeup artist Dotti and represent Luxury (District 4) (pictured above) and Fishing (District 1). While we love the effervescent feel of the latter, we love the luxe gold mixed with the vampy dark red lipstick (very Lily Collins, no?). It also kind of reminds us of the Metropolis-inspired beauty at Badgley Mischka’s Fall 2012 show. The collection will include nail polish, nail decals, mascara, lip gloss, and more. Now, go study some Effie Trinket YouTube tutorials.” Read on and see pictures of the collection here. From SportsGrid: In the market for a mansion? 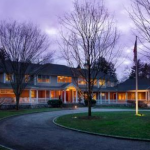 SportsGrid explains, “Former MLB pitcher Curt Schilling has a problem: Nobody wants to buy his Medfield, MA mansion. Originally listed by Schilling for $8 million back in 2008, the price has been slashed numerous times, down to $4.5 million, then $3.5 million, then $3.2 million, and now for the low, low price of $2.99 million. This place is perfect for the (rich) New England sports fan. It was once owned by Drew Bledsoe, who sold it to Schilling back in 2004. The 7,890-square-foot home features a basketball court/hockey rink, a beach volleyball court, pitching and batting cages, putting green, swimming pool, billiards room and more. Don’t you want all that stuff? Give Schilling a call, take this place off his hands. After the whole 38 Studios debacle, he could use the money.” See pictures of the house here. From The Mary Sue: Is Google rewriting the dictionary? 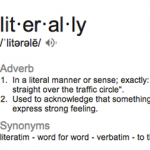 The Mary Sue reports, “Google has rocked the foundations of language nerds and Internet users the world over by adding a second definition to the word ‘literally’ in their dictionary. As you can see above, that definition is basically ‘figuratively,’ i.e. the common colloquial usage of literally, i.e. the exact opposite of ‘literally.’ For example: ‘I literally want to punch that guy in the face for taking up two seats on the subway.’ I do not, literally, want to punch the person (…or do I? ), but by saying ‘literally’ I’m adding emphasis to what would otherwise be a rather humdrum statement about subway etiquette. This might be a controversial viewpoint, but I’m all for the additional meaning of ‘literally.’ Language is a constantly evolving creature; the rules aren’t set in stone, much as we might like to think they are. Awesome used to mean awe-inspiring, but at some point people started using it to mean the less-intense “cool,” and that’s OK, because the way we use words changes.” Read on here. From The Jane Dough: Today, an xoJane writer chronicles her short-lived obsession with NBC America’s Got Talent for The Jane Dough: “I have a hard time imagining that Nick Cannon grew up wanting to be a talent show host. Then as I type this I realize that no, that’s not hard to imagine at all. 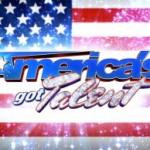 America’s Got Talent, if you’re not familiar, is a talent show with all the awkwardness of the one you were in in elementary school — no, junior high, complete with what I’m imagining is a lot of nervous farting and erections, but with full-grown adults making up a large portion of the contestants. Howard Stern, Heidi Klum, Scary Spice and Howie Mandel (of Deal or No Deal fame) are the judges. Howie is the token hypochondriac—I actually find it quite edgy that the show has a token hypochondriac. I wish I could elaborate on this but that’s pretty much where my thought process ends on the topic.” Read more here. From The Braiser: Haven’t managed to wake up early enough to get a cronut? There’s a new method, writes The Braiser, “Have we reached that point, America? The point where cronuts turn into the meth of the pastry world (the crank-nut)? Where people sacrifice time and dignity to get their hands on the fried stuff? Where people dye their meth blue knock off the cronut as a substitute for The Real Thing? Where normal human beings, addicted to the 99% pure pastry madness, dig through the trash of Dominique “Heisenberg” Ansel to get their hit? Apparently, yes, according to the Gothamist, who got their hands on a photo of two women rummaging through what is obviously a trash bagbehind the famed pastry shop, like two addicts who, swear to Jeebus, think there’s one more rock in the bottom of that Solo cup.” Read on here.